Lock in a great price for Corinthia Palace Hotel & Spa – rated 8.9 by recent guests! Great central location. We were there only for two nights, and spent most of the days catching up with family members all over the island, so the location was perfect for our purpose. Large room. Large and comfortable bed. Good wifi. Nice breakfast. Nice indoor pool. Breakfast, which was included, was the best I've ever had. Every day there was a specialty item - bacon, peanut butter and banana waffles (nyum); bacon and egg mini croissants; bread pudding croquettes. The staff were helpful, pleasant and witty without fail. The hotel is situated among lovely gardens (which I could see from balcony) and is across the street from the San Anton Gardens and the president's palace. Admission is free and it's a lovely way to escape the hustle and bustle for a few hours. Enjoy a coffee and a book on one of the many benches; stumble across sunbathing turtles, a strutting peacock, black and white swans, sleepy cat and grumpy cat. The plants and trees are clearly labelled and come from around the world. We always choose to stay at the Corinthia Palace when travelling either for business or pleasure; excellent customercentric service, quality and always a very warm welcome. This was one of the best hotels I have ever stayed at. The staff were exceptional: super friendly and attentive. I’ll definitely be recommending it to family and friends and will hope to revisit very soon. Excellent, professional yet friendly staff who all did their jobs efficiently. The hotel itself deserves its five stars. The room was traditional and comfortable and was well-serviced unobtrusively daily. Choice of imaginative restaurants at generally good value. The Maltese staff were incredibly warm and friendly. The hotel is very pleasant and spacious. We we loved our room and found the bed comfortable with beautiful, crisp cotton sheets. The products in the bathroom were nice and everything was to a high standard. The staff's hospitality was impeccable!!! The staff were friendly, warm, welcoming and attentive. We were welcomed with a glass of chilled orange juice and they told us everything we needed to know. A porter escorted us up to our rooms, all the while telling us about the hotel facilities, opening times and so on. The staff really went above and beyond our expectations from the moment we walked in. We were very impressed on that front. 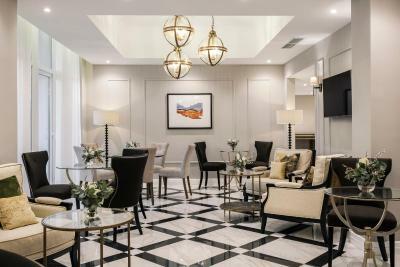 Corinthia Palace Hotel & Spa This rating is a reflection of how the property compares to the industry standard when it comes to price, facilities and services available. It's based on a self-evaluation by the property. Use this rating to help choose your stay! This boutique hotel was built around an elegant, converted villa from the 19th century. It faces the Presidential Palace and is next to the beautiful San Anton Botanical Gardens. Surrounded by its beautifully landscaped gardens, the Corinthia Palace is a peaceful setting for a relaxing break and one of the island's leading 5-star hotels. Choose from over 50 different treatments at the Atheneum Spa or just relax by the pool. Dining here is also a real treat. Enjoy a wide range of cuisine, from Italian to Oriental. Choose from an à la carte service or a light snack at the bar. 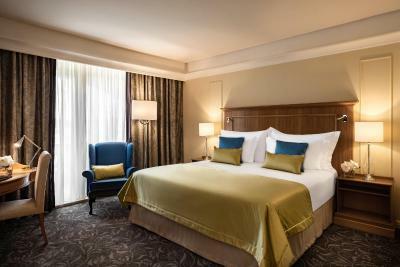 Corinthia Palace Hotel & Spa features spacious guest rooms, all complete with a private balcony and all modern comforts. The professional team of staff are always on hand and will be delighted to be of service to you. You are well located for exploring Malta. The walled city of Medina is just 2.5 mi from the hotel, while the popular resort of St Julians is 4.3 mi away. The Corinthia Palace Hotel & Spa offers a free evening shuttle service to St. Julian's, enabling you to enjoy the night life there, and return to your quiet accommodations with ease. This property is also rated for the best value in Attard! Guests are getting more for their money when compared to other properties in this city. When would you like to stay at Corinthia Palace Hotel & Spa? Featuring 2 interconnecting rooms. The bedroom features either one double or 2 single beds and a walk-in closet. The living room has a large balcony with lounge chairs. With balcony overlooking the gardens, this air-conditioned room comes with a flat-screen TV and a kettle. The bathroom includes bathrobes and slippers, free toiletries and a hairdryer. This bedroom features a private balcony overlooking the garden, a mini-bar, and tea/coffee making facilities. The bathroom includes bathrobes and slippers, free toiletries and a hairdryer. Our hotel is enveloped in history, prestige and tradition. The Villa Corinthia, our main restaurant still used to this day is over a century old and the hotel is built on what once were its gardens. The 147-bedroom hotel thrives with charm and elegance; all bedrooms overlook one of our gardens and are complete with a specious balcony. The Caprice Lounge is the perfect spot for pre or post dinner drinks, equipped with a vast range of whiskey’s and brandy’s. 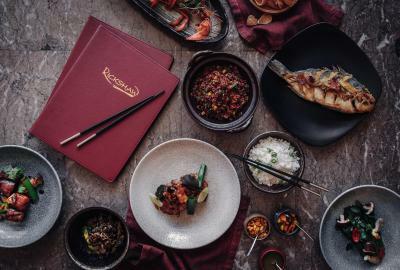 Immerse yourself in the wonders of the orient, travel from Singapore, China, Thailand and beyond at our award-winning Rickshaw Far Eastern restaurant. Unwind within the serenity of our Spa or pool gardens and dine under the start at The Summer Kitchen. House Rules Corinthia Palace Hotel & Spa takes special requests – add in the next step! Corinthia Palace Hotel &amp; Spa accepts these cards and reserves the right to temporarily hold an amount prior to arrival. Corinthia Palace Hotel & Spa accepts these cards and reserves the right to temporarily hold an amount prior to arrival. Please note that when booking 10 rooms or more, different policies and additional supplements may apply. That I did not make better use of the facilities available. Outstanding service. Outstanding chinese restaurant food. We were surprised with an anniversary card and large piece of cake along with the alcohol-free champagne I had asked for. The breakfast spread was large with a little section for locally sourced typical maltese bites. I have been to larger and more expensive hotels in Malta and nothing quite beats the service of Corinthia palace. I had limited mobility and every member of staff that I came across went out of their way to help me and everything that I requested was dealt with efficiently. This is one of those hotels where the staff make you feel like a privileged guest every step of the way , the architecture is gorgeous, the room I had was very comfortable, I would stay there again. Superb choice of restaurants serving fsbulous food for all tastes within the hotel. In the cooler months, the ventilation system is centrally switched from aircon/cooling to heating mode. Even though we switched the heating off, we still found the bedroom uncomfortably hot. There was a wedding party one night we were there, which meant one of the restaurants was out of action and the music could be heard from our room - whilst it didn't go on too late, it would have been helpful to have been informed about the function when we checked in. Probably the best hotel breakfast we have ever had. 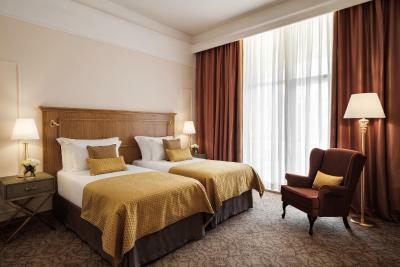 The hotel is very tastefully appointed, well maintained, and deserving of its five-star rating. The rooms and restaurants are very comfortable, and the gym is well equipped. Once the spa renovations are complete, it will no doubt be even better. The free shuttle to/from Valetta proved to be most useful. Nothing really, but I could mention that the only mirror in the bedroom was on the bathroom door which was somewhat inconvient. Everything about the hotel was very much to our satisfaction. Staff were all friendly and very helpful. The bedroom was spacious, very comfortable and very clean. Breakfast was one of the best. We had one dinner in the Orange Grove on the night of our lateish arrival and that was very good. We also had one dinner in the Rickshaw. Again the staff were very welcoming and attentive. Personally I was slightly underwhelmed with the food, especially the starters and the deserts. - The pool area was under reconstruction / no facilities were available, but it wasn't mentioned when I reserved. - The elegant restaurant inside the hotel was closed or used for a private party, we could only reserve once in five days. - Two elevators near the rooms were closed or under reconstruction. We used to go to that hotel for the special ambience and location. Very comfortable beds, beautiful pool and superb fitness room. Lovely setting, very freindly and attentive staff great food and drink,most speak good English. Great experience. Will be back! Just being renovated and looks very fresh also. Staff from reception through our whole stay were amazing. Certainly deserves it's 5 star rating. - The Jacuzzi was not working and the indoor pool was under maintenance and so cold, so technically we couldn't use the indoor pool. - The tap water of Malta is not drinkable and for each very small bottle of water we had to pay three euros! This was extremely overpriced and makes you feel that you are staying in a hostel in which every little thing is charged separately! So unprofessional for a 5 start hotel! - When we checked the bill, we noticed that the hotel has already charged us for a contribution to a charity! This is a nice gesture and everyone would accept a small contribution but a better way was asking us before charging us! - Due to adverse weather conditions, the internet went out of service. Although this is not their fault, with a Wifi that didn't work and with a pool that was cold, we felt trapped in the hotel because no other entertainment activities were possible.